James Moore of the Vermont Public Interest Research Group (VPIRG) told the Rutland Herald newspaper that David Lamont, an expert from the Vermont Department of Public Service, swore under oath before regulators last month that the state would benefit from a bill like the one Douglas just vetoed. Lamont’s boss is a Douglas appointee. "The only way to be 100 percent assured that Entergy will bear the full costs of decommissioning is to have an assurance from the parent company that it will cover any shortfall in the fund," Lamont said. Tony Klein is chairman of the Vermont House’s Natural Resources and Energy Committee. He told the Herald he was “saddened” by the veto. Klein said did not know whether the legislature would attempt to override the veto during its special session on the 2010 budget planned for early next month. But the legislature is planning to vote some time between January and May 2010 on whether Yankee will be allowed to run after 2012. "And if we vote next year that the plant should not be allowed to operate beyond 2012, you can bet that we'll also have a bill requiring them to fund decommissioning," Klein said. Submitted by Eesha Williams on Fri, 05/22/2009 - 19:47. Thank you for the thoughtful comments. 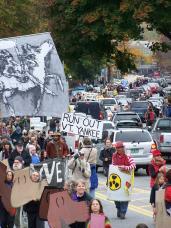 The cost of cleaning up Entergy's mess in Vermont is estimated to be around $1 billion. Submitted by Anonymous on Fri, 05/22/2009 - 19:13. I guess that means anyone who votes for Douglas would rather pay for the decommissioning themselves. Submitted by Anonymous on Fri, 05/22/2009 - 18:09. The bill that the governor vetoed today for a second time is a bill that is most important for protecting Vermonters. First, to veto the bill on a Friday afternoon before Memorial Day Weekend is just plain chicken. He did so in an attempt to bury the story amidst parades and celebration. Second, his reasoning for the veto is flawed. The bill did not "break a deal". The House bill was more restrictive, but the Senate bill was much weaker. The final compromist bill was tied to the sale of the plant to the shell, LLC, Enexus. Entergy would have to fully fund the decommissioning if they sell the plant. The bipartisan Oversight Panel stated that the sale of the plant to this new, LLC would impact the plant's reliability. The other trigger was 2012. Should the plant not go forward then Entergy would have to meet its obligation. Douglas has made it clear that he is on the side of Entergy and is willing to compromise Vermonters. It's a sad day for this state.